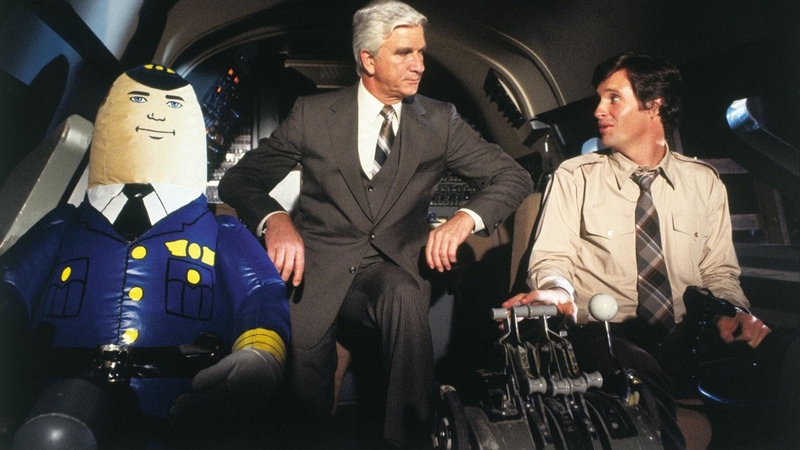 For those readers who know of this film and it’s significance, just think of the fun you can have over a few beers and tell all your unsuspecting pals that you all ought to kick back and have a belly full of laughs watching the 1980 comedy smash hit, Airplane. 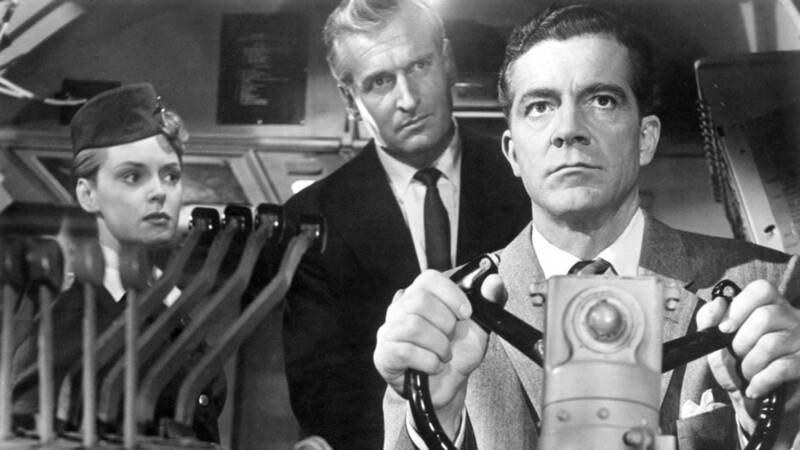 Just when they’ve had a little too much to drink, press play on the DVD machine and let Dana Andrews take to the skies in the “original” straight version of Airplane. The gang is bound to wonder just how much they’ve had to drink by this time. 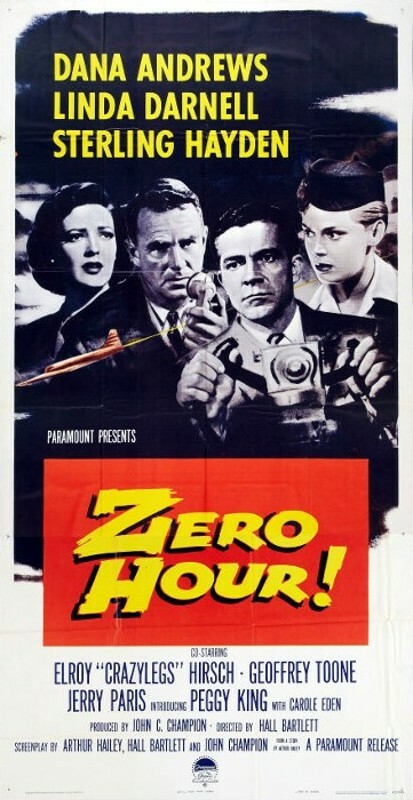 After far too many years, I revisited this early plane disaster film and had no idea that it takes place over Canadian skies as the plane piloted by Dana is trying to make it’s way across western Canada and the Rockies towards Vancouver into the open arms of Sterling Hayden. The role eventually re-enacted by Lloyd Bridges and yes Sterling does give us the line, “I picked the wrong week to quit smoking.” No he doesn’t mention anything about sniffing glue. It’s nearly impossible to watch let alone write something about this film without referencing the far more popular film from the team of Abrahams and Zucker. Dana plays the disgraced pilot who lost a whole platoon of flyers near the end of WW2 through a foggy mishap and blames himself. Years later he’s married to Linda Darnell and they have a son Joey who is going to find himself in a cockpit before long though he isn’t asked any questions about seeing a grown man naked. He does get the model airplane though. Cue the line borrowed from this script for the latter film, ” Joey, here’s something we give our special visitors. Would you like to have it? ” then we do get the, “You ever been in a cockpit before? ” question. When Darnell bolts the marriage with Joey in tow, Dana attempts to win them back and fighting his demons boards the same plane that is headed for near disaster. 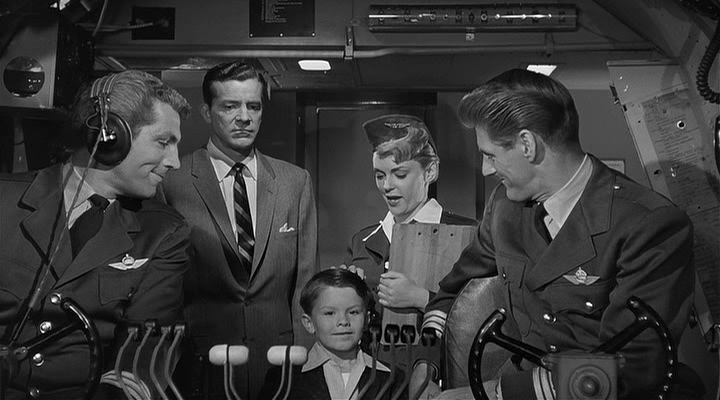 It’s a good thing he goes with the meat over the fish when stewardess Peggy King takes his order. 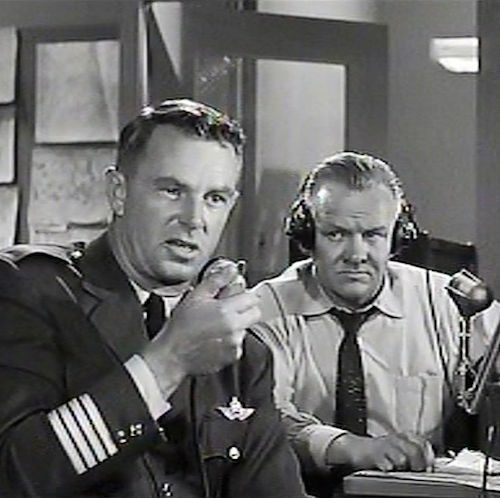 The pilots aren’t so lucky and shortly after Joey’s visit to the cockpit, the pair of flyers are passed out and in the care of the good doctor Geoffrey Toone who also stuck with the meat long before Leslie Nielsen was considered anything but a straight leading man with very little range. Canadian viewers listen up to a group of old timers on the plane. I thought they were at first talking soccer but when the term Argo’s came up I realized it was a reference to Toronto’s CFL football team. Could this be the one and only Hollywood reference to not only the Argo’s but maybe even the Canadian Football League? “It’s the fish!” Good thing Dr. Toone carries around pills in his coat pocket for people to “pop”. Honestly, due to Airplane! it’s just too easy to poke fun at what was once a serious film and not a bad one either from this point in the career of Dana Andrews’ fading box office appeal. His role here actually recalls what might be his greatest, that of Fred Derry in The Best Years of Our Lives as a haunted flyer who returns home from the war in William Wyler’s magnificent tribute to the returning war vets of WW2. To add a bit of melodrama into a film already overflowing with it, Hayden is an old acquaintance of Andrews from the air force and the two don’t like each other. 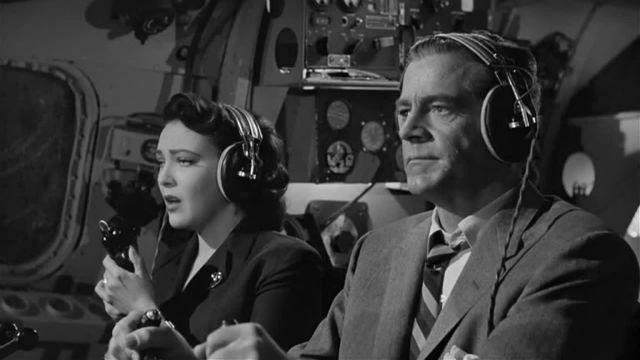 They’ll verbally spar over the airwaves with Linda Darnell sitting in the co-pilots seat as she aids her husband in saving the plane and it’s occupants including little Joey who had that damned fish. Can Dana save the plane, the passengers and gain the respect of Hayden and win his wife and child back in the bargain? I don’t know, ask Robert Hays, Leslie Nielsen or the autopilot. This does take a big leap of concentration to see it for its original intention. Even though I really tried and was able to get into it at various points a character would drop a phrase or a situation would present itself that was a template for a scene in Airplane! and I was right back out. Hayden was his usual block of wood but Dana Andrews did pretty well, considering he was apparently crocked throughout filming, as did Linda Darnell though her role was rather thankless. It was also interesting to see the two of them reunited after Fallen Angel where both had better roles especially Linda. She’s really splendid in that one. Hayden really does give us the stoic wooden indian this time out. Linda was such a beauty, a sad ending awaited her. tragic. Currently reading a bio on Dana and yup, he was a bad boozer. Still seemed to do ok on screen though thru most of his drinking. Oh how funny, I never knew this film had inspired Airplane. And the kid in the cockpit! Oh my I never knew, All too funny. Cheers for the knowledge. This can really throw people for a loop if you sneak it into the dvd player. It’s like an alternative universe. Have fun with it. I’m not sure if there’s another situation like this where a fairly forgotten B film got turned into a hit comedy. Satire films are plenty like Mel Brooks work but he mainly attacks genres. I can think of three absorbing films with this theme: ‘No Highway In The Sky’ (1951), with James Stewart and Marlene Dietrich, and based on a novel by Nevil Shute; ‘The High And The Mighty’ (1954), with John Wayne, Claire Trevor, Robert Stack, and a generally excellent cast – and based on the novel by Ernest K. Gann; ‘Fate Is The Hunter’ (1964), with Glenn Ford, Nancy Kwan, and Rod Taylor. It shares its title with a (1961) memoir also written by Ernest K. Gann. I’ve seen them all and they’re on the shelf her but I’ve only seen the Duke film recently enough to recall it. The other two I picked up on blu so I’m do to see them again after many years of a late show viewing on TV. And don’t forget, basketball star Kareem Abdul-Jabbar in the role originally played by football star Elroy ‘Crazy Legs’ Hirsch! And I agree with Carl-Edward: ‘No Highway in the Sky’ is a darn good one, and well worth checking out! This film is hard to take when all you know of is the comedy version. Long time since I’ve seen No Highway but hoping to snag the blu put out by Kino for a revisit.